Clinton vows support for Georgia, slams Russian "occupation"
US Secretary of State Hillary Clinton reassured Georgia on Monday with a pledge of continued support and criticised Russia's "occupation" of two breakaway Georgian regions. On her first visit to the ex-Soviet country as secretary of state, Clinton told a group of women leaders that Washington would also keep pushing for further democratic reforms in Georgia. "We continue to object to and criticise actions by Russia which we believe are wrong and on the top of the list is the invasion and occupation of Georgia," Clinton said shortly after arriving in the capital Tbilisi as part of a regional tour. "The United States supports the Georgian people, we support Georgian democracy," she said. Clinton was due to meet later with Georgian President Mikheil Saakashvili, who will be looking for reassurances Washington has not abandoned support for his country amid a "reset" in relations with Moscow. Tbilisi is hoping Clinton will take a hard line on Russia's military presence in the rebel regions of South Ossetia and Abkhazia and that she will reiterate US support for Georgia's hopes of joining the NATO military alliance. 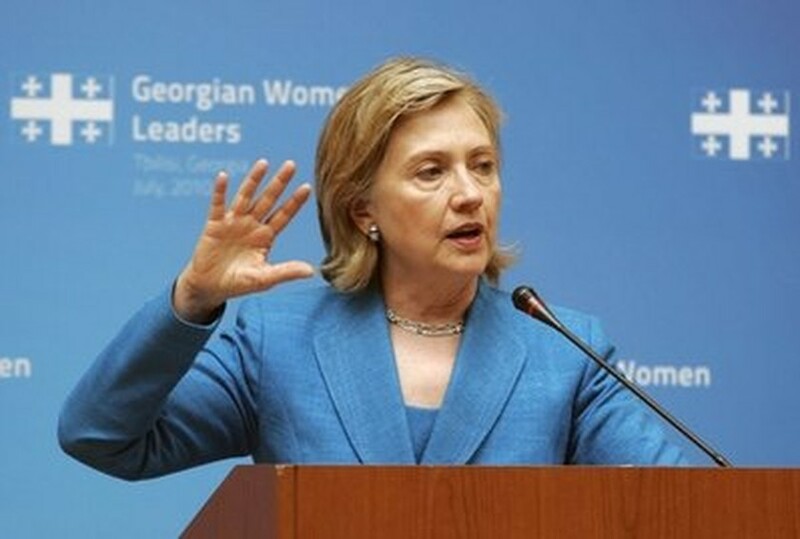 Clinton urged further reforms in Georgia, saying a vibrant democracy and economy were key for it to regain control of the rebel territories. "The more vibrant, effective a democracy and economy Georgia becomes, a greater contrast there will be between South Ossetia and Abkhazia and the rest of Georgia," she said. Clinton was on the final stop of a tour of eastern European and Caucasus region countries that has also taken her to Ukraine, Poland, Azerbaijan and Armenia. She is also due to meet opposition leaders in Georgia, who have accused Saakashvili of stepping back from democratic reforms after coming to power in the country's 2003 pro-Western Rose Revolution. Saakashvili enjoyed extremely close ties with former US president George W. Bush, who famously declared the country a "beacon of liberty" in a 2005 speech to thousands of cheering Georgians in central Tbilisi. Georgia has even named a main road from the airport after Bush. Relations have cooled under President Barack Obama, however, after Saakashvili's international reputation was damaged by a 2007 crackdown on opposition protesters and by his handling of Georgia's 2008 war with Russia. Georgia has downplayed the cooling in relations and contributed nearly 1,000 troops to fight alongside US forces in Afghanistan in a bid to build closer ties with the new administration. US officials have repeatedly voiced support for Georgia's territorial integrity after the 2008 war, which saw Russian forces pour into the country to repel a Georgian military assault on Moscow-backed South Ossetia. Russia after the war recognised South Ossetia and Abkhazia as independent states, a move that has been followed by only a handful of countries. Russia has since established permanent military bases and deployed hundreds of troops and border guards in the regions. During a visit to Tbilisi a year ago, US Vice President Joe Biden said Washington continued to back Georgia's territorial integrity and its bid to join NATO but also called for progress on democratic reforms.